Ticks are found almost in any part of the world but they prosper more in warmer regions. The brown dog tick is among the hundreds of tick types that plague mammals including dogs hence they are often found in many homes. Among all known tick types, this is probably the oddest one. Ticks are known to live, exist and complete a life cycle in places where they are known to thrive: wooded, grassy and shrubby areas but this particular type can survive its entire life indoors. Pets are known to be transporters of ticks from outside to the comforts of our homes but often, the ticks will not last being confined within. Not for this particular tick though because being able to survive the atmosphere inside the house, it can complete a whole life cycle from eggs to larvae to nymp to being an adult tick. It does not need any outside element for as long as its favorite host, the dog, is there. Just like other ticks species, this tick feeds on a wide variety of mammals but because most homes own a dog, canines have seemingly become a favorite target. Able to survive the conditions indoors, these ticks are now known to exist in many parts of the world even in colder regions. Bigger brown dog tick infestations are becoming a problem as they can happen in such a short time given the availability of a host. A dog that carried a single female tick carrying eggs with it inside the home can start an infestation. Because it is a very commonly seen type of tick, identifying it can be easy even if it has no special markings. It is relatively small, its color red-brown hence the name red ticks in some parts of the world. Its body shape is quite elongated and the area that attaches its head to the body has a hexagonal shape. You can find the adult male and female rhipicephalus sanguineus at any given time of the year. While they prefer dogs, their hosts could vary from other large animals to humans. The female tick requires about 7 days of blood meal to become engorged and nourish eggs that could reach about 4,000. Males would feed shortly before mating. The eggs, often laid in hidden areas of the house, take about 2 to 5 weeks before they are hatched. 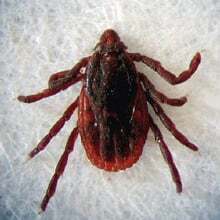 An adult tick could survive months without a host or blood meal. Nymphs, just like an adult brown dog tick can go on without feeding for up to 9 months. They feed on several mammals although top preference is canine and sometimes humans. A nymph would need to feed for up to 10 days before it drops from its host to move to its next stage temporarily hiding from sight if inside the home. Just like the nymphs, ticks at this stage can last up to 9 months without a blood meal and are also active throughout the year. They will feed for up to 7 days for the needed nourishment then detach from its host for about 2 weeks to become a nymph. At any stage, the brown dog tick that is inside the house may be hiding anywhere it is not easily spotted.